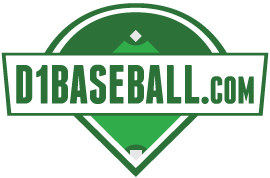 Check out our stats, placements, and rates and start advertising on the home of college baseball. 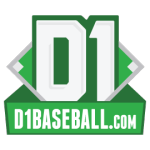 We’re proud to announce that D1baseball.com, the original home for college baseball scores, is now offering a totally revamped college baseball experience. In addition to the expansive statistical data that we’ve always been known for, D1baseball.com has been redesigned from the ground up, and now includes college baseball news provided by a team of highly respected writers, including the on-the-field face of college baseball Kyle Peterson, Kendall Rogers, formerly of Yahoo! Sports and Perfect Game USA, and Aaron Fitt who spent the last decade on the college baseball beat for Baseball America. Overall Traffic – As a result of daily news, D1baseball.com projects substantial traffic increases through different referral outlets, including organic search results and social media. Historically, D1baseball.com has reached more than 22 million visitors annually, and this number is projected to increase to roughly 25 million in 2015. Extended Exposure – D1baseball.com is more user-friendly than ever, and time spent on site by our users is expected to increase dramatically, improving the ability for advertisers to create meaningful impressions. D1baseball.com offers device and placement targeting to help advertisers more effectively reach their audience. Device Targeting – Advertisers have the ability to target desktop and/or mobile users specifically. Placement Targeting – Advertisements can be placed site-wide, regionally, or on team-specific pages. Note: Represents impressions measured by Moat Analytics, broader industry metrics may vary; includes banner, rich media and IAB Rising Star units; *primarily in the US and UK Source: Moat Analytics, “Q3 2014 Benchmark Report,” Nov. 14, 2014. Note: Represents impressions measured by Moat Analytics, broader industry metrics may vary; in-browser only; including banners, rich media and IAB Rising Stars units; *primarily in the US and UK Source: Moat analytics, “Q3 2014 Benchmark Report,” Nov. 14,2014. Screenwide display ads on mobile had an in-view rate for 320×50 placements coming in at 64.6%—nearly 18 percentage points above average. Worldwide, 120×240 placements performed the best for viewability, with a rate of 55.6%. Units that were 240×400, 160×600 and 120×600 rounded out the top four. Note: In-view rate is defined as the percent of impressions where at least 50% of an ad was actively in-view for at least one continuous second. In-view time refers to the length of time an ad has been active and in-view. 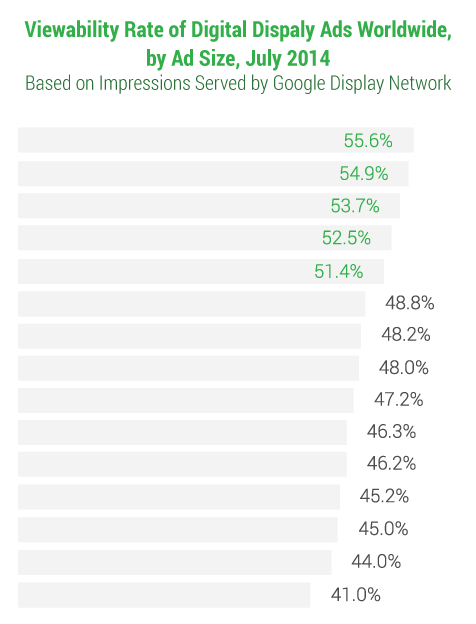 Universal interaction rate is the percent of impressions where a user entered the frame of an ad and remained active for at least 0.5 seconds. Universal interaction time is the average length of time the user interacted with an ad.